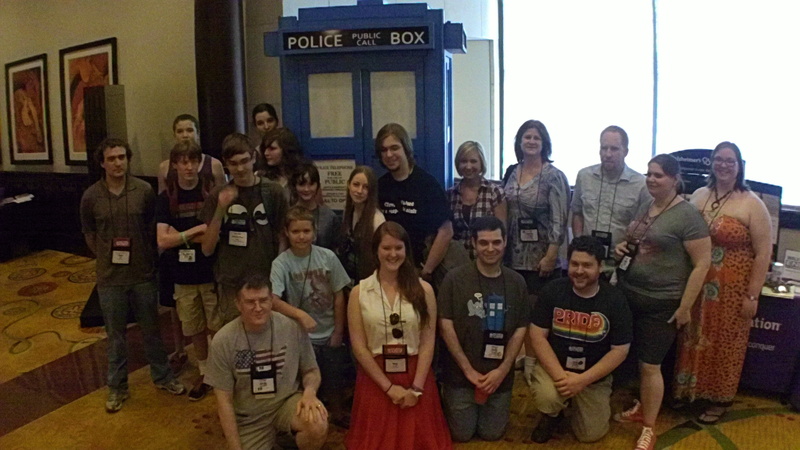 We want YOU to be a TARDIS Game volunteer! 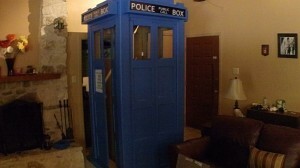 The night before the TARDIS took damage, we had to rework corner hinges, replace windows, and worry about repainting. Eventually we just got it working, gave up on repainting and the hauled it to the con. It is just a little blue box, but clearly it has deeper meaning. People were practically worshipping it. 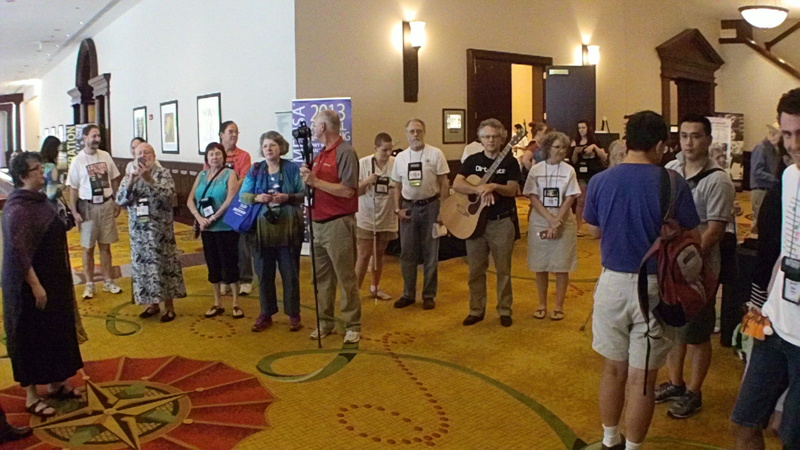 We showed up at 8:30pm at the hotel, and began to assemble it for the convention weekend. In under 5 minutes, we had a crowd of 15 around us, within half an hour it was a mob of 30. Gleeful, joyous, chatty and engaging. 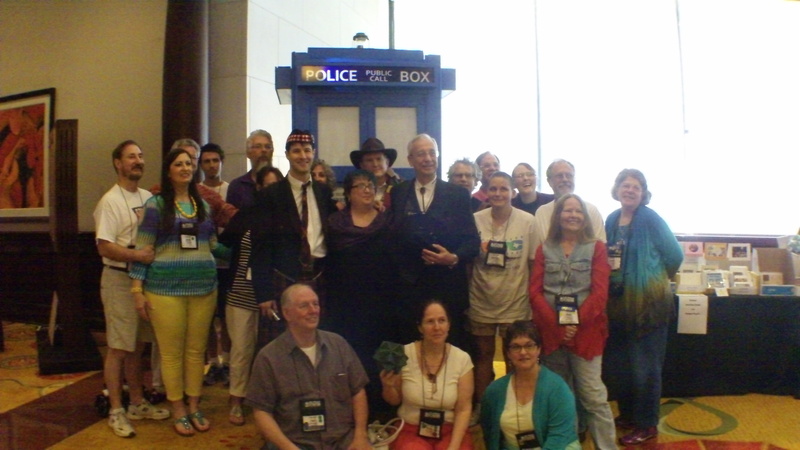 Chris and I were heros, we had brought a TARDIS to the con. We were instantly ‘cool’. The next day was Thursday, our trial by fire – keep people from stacking inside the TARDIS and trying to keep fans in line from stepping on the weak fractured base that we didn’t have time to fix. That wasn’t all, we had invented a Dr Who scavenger hunt game ‘Don’t Blink’ that spans 3 days (1.5 hour per segment) and we had half the props in hand and 3/4 the rules in our heads. But we were going to launch the game no matter what. But no help from the con. We were encouraged to bring the TARDIS but were unofficially sanctioned with ‘plausible deniability’ in case it flopped. So we weren’t in the program, no mention in the schedule, on the wall, or the boards. We didn’t exist. Getting players could be a problem, this could really flop, like other half-assed projects I’ve done. But quickly we had volunteers show up, too many in fact, a total of 14 which is more than we needed but we found a way to use them. Then the players showed up, ejecting other competing seminars from their busy schedule to help save the Doctor. Buy the time the game started, we had 30 players, all who co-operatively we divided into teams of 4 to try to recover parts of the Transmitter the Doctor sent forward in time to override the Weeping Angels jammer. 1.25 hours later and the teams returned. At the debrief of “What did we do right, and wrong” they gave us a high grade, and then proceeded to give awesome ideas how to improve it further. The Doctor got tapped by a weeping angel. These players helped save him. Day 2 of Don’t Blink went just as Ad Hoc as day 1. Twenty players this time, many repeats from day 1. But this time Chris was in charge of it, and better organized. I was greatly appreciative of him. My blood pressure had been rising. The game was more of a ‘live clue’ this time, where players interviewed 5 holographic projections from the TARDIS core library. Each team only got to put forth one question per interview before going on to the next hologram. The players were giddy, it appeared. 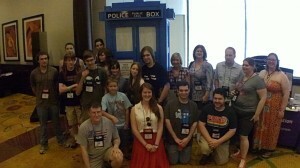 Something about being able to immerse and interact with the Whovian world. Perhaps a personal fantasy of helping the Doctor was involved, but I don’t know for sure. The winning team didn’t even care for a prize, helping the fictitious Doctor seemed to be reward enough. But we gave them jelly babies anyway. Day 3 game was really the agile development of day 1 game. We’d added in what people liked, and culled what they didn’t. Spiced it up with an active Weeping angel who could sneak up on players, tag them and send them to the game-master to be put into time-out for 3 minutes. All pieces in their possession are forfeited to the Angel. The players looked nervous, watching their backs, in a I’m-having-a-blast kind of way. Team Black-Hat cornered the Weeping angle on the stairs, and held her in dimensional lock for 10 minutes, there was a sigh of relief, but then she got loose when all the teams thought she was still trapped. Tap. Tap. Tap. In the end, enough peices were found to complete the power supply, power the transmitter up and permit the Doctor to recall the TARDIS and return. 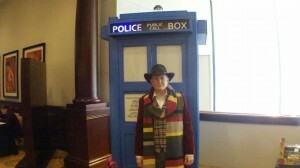 Just in time to help with the wedding of a wonderful couple who wanted to be married at the TARDIS by the doctor. Just in time for the wedding. Posted in musings and tagged Dr Who, TARDIS, Whovians by admin with no comments yet.